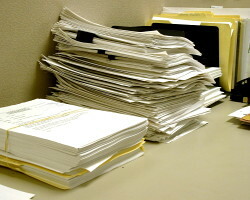 How can I reduce the energy wasted in my office? How can I get my colleagues to waste less energy without being seen as a nag? Everyone always turns the heating on instead of bringing a jumper and then when it gets too hot, they open a window instead of turning the heating down! It drives me mad! When I used to work full time in an office, I always made sure I had a cardigan over the back of my chair for those chilly days – but it’s not like you can forceably wrap an office-mate in a woolly when the temperature drops. I’d possibly try talking to management about it – in a general way rather than tattle-tailing. If you’re in a small company, you can appeal to them on a financial level since all that wasted energy is wasted money. Bigger companies might not care about that because it’s such a small proportion of their turnover – but most big companies have an environmental policy now and that might sway them. Of course getting management on board doesn’t mean that the rest of the staff will comply and in some places, a management decree will do the opposite… so what else could Lynda try? Has anyone had any experience of encouraging reluctant colleagues to change their ways? What works without getting people’s backs up? What doesn’t? 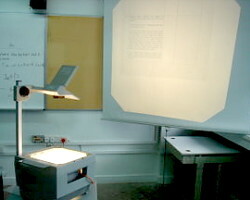 How can I reuse or recycle overhead projector transparencies? Now all my college’s lecture rooms FINALLY let you use powerpoint, I can get rid of all the OHP lecture notes I’ve created over the years. What can I do with them? According to Wikipedia, most transparencies are sheets of cellulose acetate. The Google results are confusing but I think cellulose acetate can be recycled but I suspect it’s carried out more at a manufacturing level than post-consumer. Anyone know for sure? What about reuses? I imagine they can be used like old photo negatives to make lampshades and the like – probably would work better for those with photocopied pictures, diagrams or text on rather than hand-written notes. Other ideas? How can I make a notebook out of recycled materials? How can I reuse or recycle the spiral of a spiral bound notebook? How can I reuse or recycle hanging files? How can I reuse or recycle glue stick tubes? 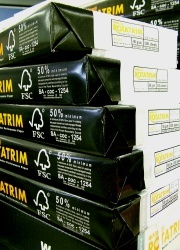 How can I reuse or recycle printer cartridges? How can I get my office or school to recycle more? We’re having a bit of a themed week here on Recycle This, focusing on stationery and since stationery items are most frequently used in offices or schools, I thought it might be fitting to have a discussion on ways and ideas to help get organisations to recycle more. Although I was inspired by the stationery stuff, I’m not just thinking stationery really – but also excess manufacturing materials. 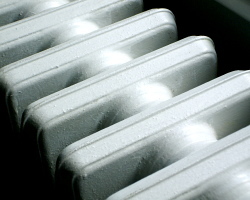 Or packaging for food in canteens/staff rooms. Have you set up, or helped set up, a recycling scheme in your place of work or school? What do you think is most important when setting up a scheme? Should you start small (perhaps focusing on doing one thing) and build up or go straight into recycling everything all the time? What are the best things to say to management/teachers to get them onboard? What about getting colleagues/classmates motivated too? Any ideas, suggestions or comments would be very useful. 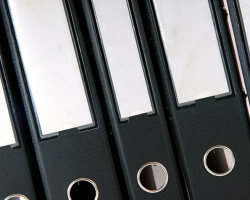 How can I reuse or recycle old lever arch files or ringbinders? I have been asked about recycling lever arch folders and as they have three main components, I didn’t know how to recycle them. Please could you advise. I’m a little confused as I can only think of three main components – the outside cardboard folder and the metal mechanism — is there something I’m missing? Either way, I’ve wondered this same thing before and with plastic covered ringbinders too. Anyone know of any recycling schemes for them as they are? I presume if the cardboard folder bit isn’t plastic coated then once the metal has been pulled out, the cardboard can just go in for recycling as normal – is that the case? Can the metal be recycled too? What about the plastic coated card ones? I suspect they’re very difficult to recycle – anyone know for sure? What about crafty ideas? If the cardboard is in ok condition, I imagine you could use transform it into a storage binder .. thing. (Words failing me… it’s Monday morning after all.) What I mean is, attach a pocket or strips of elastic to the inside and you could store, for example, knitting needles and the like in there — easy to browse but folds up neatly and sits on a shelf. Anyone done anything like that with it?